We started building boxes many years ago. We knew from our wildlife rescue experience - from picking up too many cold and broken bodies, that barn owl chicks will pop out of the nest prematurely if they don't have something to keep them in. The height of the hole is critical. After testing it last year we have concluded the entry hole should be at least 14" from the floor. The size of the hole, too, is important. It mustn't be so large that a raccoon or great horned owl could easily fit through, but not so small that the adults have difficulty. We tried the heavily recommended 3 3/4" X 4 1/2" and found it was too small - we watched adults struggle. 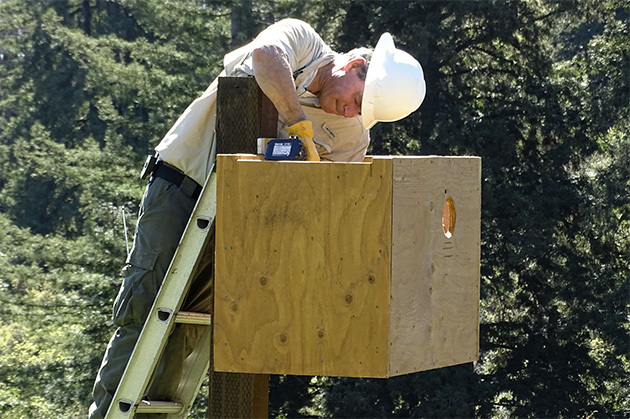 At the Haute box, the owls did not enter for weeks until we enlarged the entry. Then, only Lotte was seen visiting. We enlarged it even more, and then Teco was finally able to fit through the portal. We're now building making entrances about 5" - 5 1/2". Perches and porches are not necessary for barn owls so long as there are grip-grooves at the entryway and a perch at the entry would make it easier for a great horned owl to predate on the owls, so, we've never installed any for those reasons. 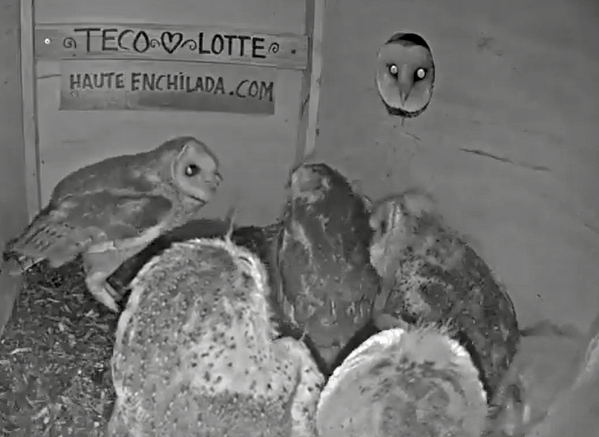 However, in watching Teco and Lotte's owlets as they near fledging age, it seems a platform just outside the entry - but at the same level as the floor, might make their first adventure out of the box less ominous. 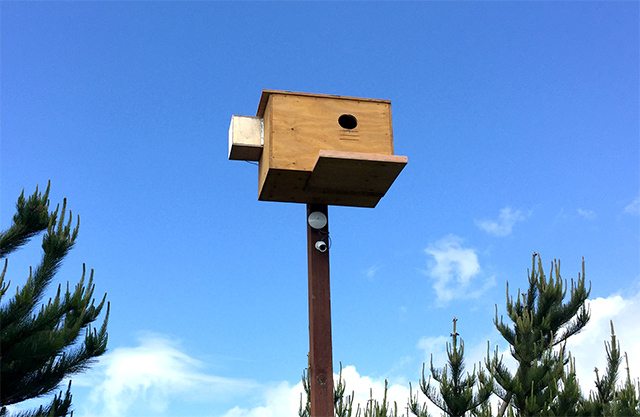 It would also give the fledglings a spot to land - a landing pad, making it much, much easier for them to return to the nest after taking their first flights. I say that because we watched Chicle last night. It was the oldest chick's first evening out and it wanted to get back inside but could not figure it out. 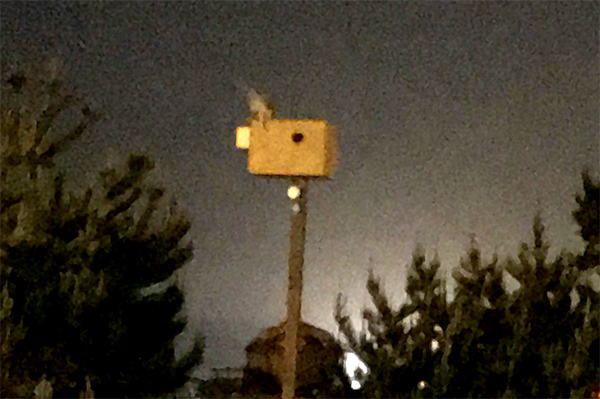 It perched on the edge of the box for some time, trying so hard to reach the hole with its talons. Chicle flew well, and could navigate to the flat top of the box with no problem, but it took quite some time before the young owl managed to get back into the nest box. So, today, we installed a short landing pad. We attached it to the bottom of the box. It has holes for drainage and a little lip to grab onto. We look forward to seeing how the chicks respond to the new platform. To all who have and continue to support our efforts, a heartfelt thank you!